You are invited to join the 38th IEEE Photovoltaic Specialists Conference, June 3-8, 2012 at the Austin Convention Center in Austin, Texas. On behalf of the Organizing, Cherry, and International Committees, I look forward to welcoming you to the conference. All abstract notifications for IEEE PVSC 38 have been sent. If you did not receive a notification, please log into your abstract submission account to view your decision letter. Sam Baldwin of DoE Energy Efficiency and Renewable Energy will be our Keynote Speaker on the subject of the simulation high penetration deployment of renewable energy in the US energy grid on Monday morning, June 4, 2012. Welcome to the PVSC 38 Website. We hope to see you all in Austin this year! Please check back regularly for the latest news and announcements. The Austin Convention Center has a convenient downtown location at 500 E. Cesar Chavez, between the shores of Lady Bird Lake and historic Sixth Street. It has easy access to I-35 and is a short distance from 6,000 downtown hotel rooms. It is only eight miles from the award-winning Austin Bergstrom International Airport. Ample parking is provided in two parking garages with a total capacity of 1,600 spaces. Convenient shuttle drop-offs are located along Trinity and Cesar Chavez streets. 201 East 2nd Street, Austin, TX 78701. Entrances on Brazos and San Jacinto streets. Most convenient parking for events scheduled in Exhibit Halls 1, 2 and 3, and meeting rooms 1-10. 601 East 5th Street, Austin, TX 78701. Entrance on 5th Street, between Red River and Sabine streets. Most convenient parking for events scheduled in Exhibit Halls 5, 4 and 3 and Level 4 meeting rooms 11-19. The Austin Convention Center Is a LEED Gold certified building located in the heart of the capital of Texas, one of the most affordable cities in America. LEED Gold Certification demonstrates ultimate green building leadership and signifies a model of sustainability that sets the standard in the industry. This achievement deepens Austin's reputation as a premier meeting and convention destination. The four-story impressive facility spans six city blocks with 370,976 square feet of exhibit and meeting space, including five column-free exhibit halls, seven ballrooms and 54 meeting rooms. Constructed of native Texas materials, from rustic limestone to polished granite, the facility's different facades reflect the architectural diversity of an historic and vibrant city. Most pre-function spaces have generous, attractive views of downtown Austin. The liberal use of windows connects attendees to the community, invites natural light and provides an open, airy experience. At the Austin Convention Center, customized technology is the standard. Rated one of the most technologically advanced convention centers in the country, this gigabit rated building can support thousands of wireless computers. The convention center offers 255 Mbps+ Internet connectivity over multiple connections and complimentary high-speed wireless Internet. On-site engineers design, install and support clients' networking needs. There's more to the Austin Convention Center than the building. From initial planning to the closing of events, clients can count on a level of attention that is unsurpassed. The gracious and professional staff's commitment to provide world-class service to its customers brings clients back year after year. Austin Convention Center attendees are just down the street from the city's vibrant nightlife, where they can enjoy everything from fine dining in four-star restaurants to down-home barbecue and authentic Tex-Mex. A few steps away from the convention center, visitors find a myriad of entertainment options, including world-famous Sixth Street and the Warehouse District. In a city where the music never stops, live music plays at nearly 200 venues on any given night. Heralded as the "Live Music Capital of the World," the city promises to provide lasting memories found deep in the heart of central Texas. 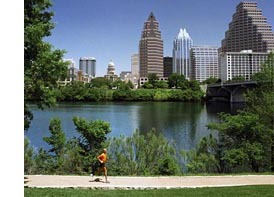 For more information about the Austin Convention Center, visit their website at www.austinconventioncenter.com. The convention center is also on Facebook.